You can use this resignation letter example due to family illness for free. Use this letter example after amending it as suitable. You can either post it after printing or email it to your Manager. 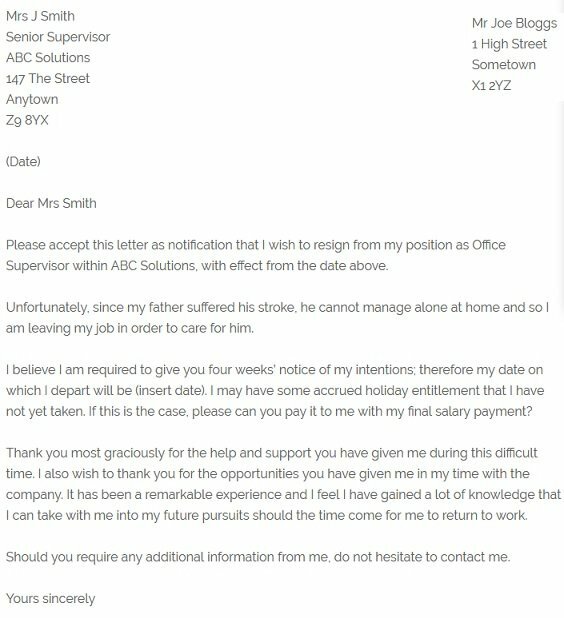 Please accept this letter as notification that I wish to resign from my position as Office Supervisor within ABC Solutions, with effect from the date above. Unfortunately, since my father suffered his stroke, he cannot manage alone at home and so I am leaving my job in order to care for him. I believe I am required to give you four weeks’ notice of my intentions; therefore my date on which I depart will be (insert date). I may have some accrued holiday entitlement that I have not yet taken. If this is the case, please can you pay it to me with my final salary payment? Thank you most graciously for the help and support you have given me during this difficult time. I also wish to thank you for the opportunities you have given me in my time with the company. It has been a remarkable experience and I feel I have gained a lot of knowledge that I can take with me into my future pursuits should the time come for me to return to work.